As a kid I remember my father being interested in photography, he toted around his Nikon, pockets stocked with slide film. For entertainment the family would cuddle up on the couch on Saturday nights and watch slide shows of our lives projected on the living room wall. I always remember loving pouring over old photographs, whether they were of my grand-parents, parents or my sisters and me, I was always transported into the past, memory, what the world was or might have been whenever I was looking at those images. I had a point and shoot from as early as I can remember, but don't remember making any interesting images until well into my twenties. My relationship with making images has evolved slowly. In 2006 I began to dedicate myself to making and selling things that I made. At first it was one of a kind clothing pieces made out of recycled fabrics, then I dove more deeply into art making from various stitched works, to letterpress, painting and mixed-media pieces. After attempting to get an installation project out in the world and failing, I realized my house was filling up with work that I couldn't store. I began making photographs because I could synthesize my various art making skills in a single image and there wasn't as much of a storage problem. Slowly I began having more and more photography based ideas and that put me on the path I am now on. What role do your children play in your work? It depends on the image. My children are usually willing participants and in some cases lend their own inspiration and suggestions to the creative process. In the case of the "Changeling," we had read a story aloud that lead to a conversation which the image grew out, similarly the "Coronation Day" grew out of a conversation about the history of the role of women in positions of power around the world. Generally I take inspiration from something that transpires and will then talk to my girls about the evolution of an idea, tell a story of a space or moment in time for them to imagine and inhabit. But there are times, like the day my younger daughter dragged every quilt in the house downstairs, stacked them on the table and climbed on top to take a seat, where they are the true seed of an idea. My older daughter and I looked at each other and both said princess and the pea... We have to make the princess and the pea. The ideas started to spin, but in the end we had more fun building the stack of quilts and goofing around, the final image we made is not what I initially envisioned, but perhaps because to actualize it would have been a tremendous amount of work, the image we made satisfied the itch. Not all of the children in this series are my own though. More and more I've had kids request to be in images, so I now have a back up list of eager models. I also have begun to do commissions which is a whole new way of engaging and creative process. An entirely different story. How much planning goes into your images before you create? Most of my images are meticulously planned. They usually start with a vision, whether from a dream or a random idea channeled when I'm in a meditative state or even just moving through the world. I jot stuff down and sometimes sketch ideas in my notebook. I outline what I need to get ready to make an image then I organize my image ideas in a spreadsheet and rate them based on how much I want to make them, how relevant they are to what I am focused on and motivated by, how long they will take to prepare and what needs to be made or gathered in order to realize the final image. This is not to say that I don't also make more spontaneous images, but certain of my series require substantial leg work. Your work is filled with signs of the past, old books, run-down houses, rotary phones, etc... Are you wary of new technology? I am deeply compelled by history, whether it is personal/familial history or whether it is history of a space, a movement, or even an object. The A Nursery Rhyme For You series arose from raising children in an era when so many of us are constantly consumed and distracted by or engaged with devices. I was raised without access to television and that forced me to developed an interior life that is important to how I cope with the world and life today. I think that imagination is incredibly important and believe that through boredom we are more likely to develop our imaginations. Without constant distraction a young mind is unlikely to tap into its deepest imagination. So, I think it is important to unplug, to delve into the past, to delve into stories that are not our own (via reading) so as to better understand the world and ourselves. To ignore the past only sets us up to repeat the mistakes of the past and so it is not that I shun modern technology and modern life, indeed I and my children are engaged with it, but I do think that balance is essential. This series is so much about mining the past to feed the imagination and not handing children a device to entertain them. Can you talk about the use of a central or repeated color in your work? I dream and envision most of my images in their finality at the moment of conception, so my ideas usually come complete with color palette. 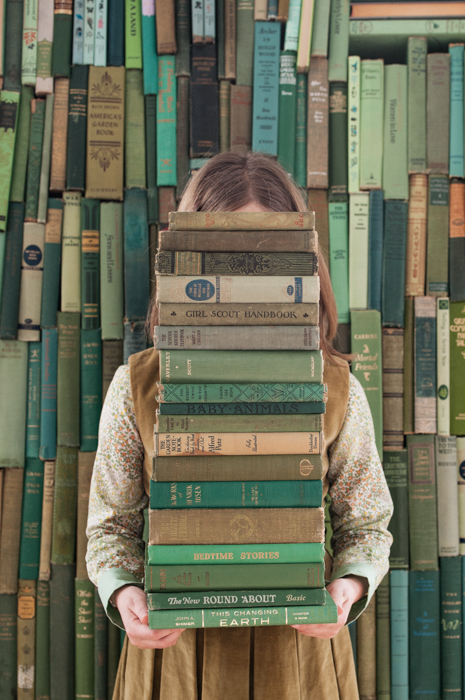 In the case of the green books, I had the opportunity to shoot in a particular space, I walked in and something in my head said green books, perhaps it was an echo of the green walled library in my grandparent's home, perhaps it was the pallor and mood of the place. I was concerned about how long I would have access to the space versus how long it would take me to collect the green books, but after being assured I could bring my idea to fruition regardless of timeline I set to work stockpiling pre-1950's green books. In some other images I have a strong sense of the general colors and what the image will be, but they are less exacting. For instance I knew I wanted a soft floral pallet with both pinks and blues for "Coronation Day: Queen of the Unicorns," but that was much more a process of collecting and making which slowly brought my concept into a tangible visual image. 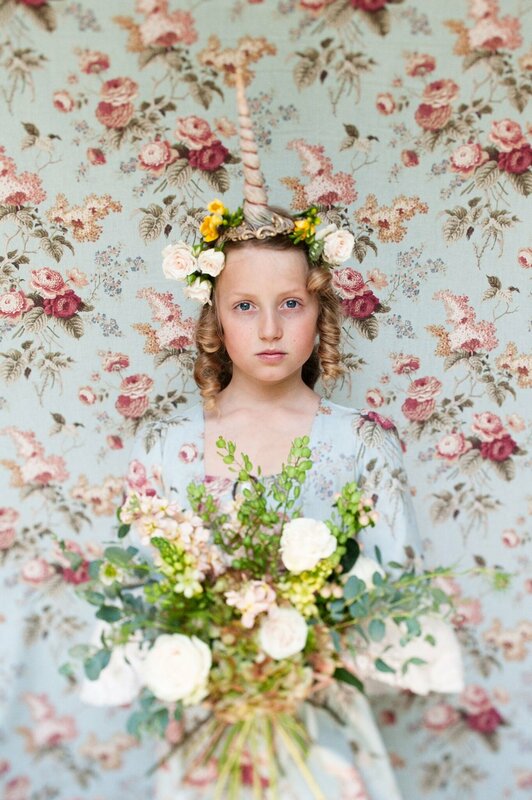 "Coronation Day - Queen of the Unicorns"
What makes a successful photograph for you? It tends to be an inexplicable feeling, but sometimes what feels successful to me isn't always what the world loves. I tend not to let that hold me back as I can only make what I envision. I do think that some of the images that I spend a tremendous amount of time on have a certain amount of energy invested in them and sometimes there is a tangible feeling conveyed by that investment. Maybe that is successful. I usually spend a long time constructing a single image and then shoot it for about an hour. Depending on what I am shooting the final image might be the first frame or the last. I don't know until I've sifted through everything, edited and re-edited. When I come back to look at everything a second time, then I am able to decide on what I think is the final image. 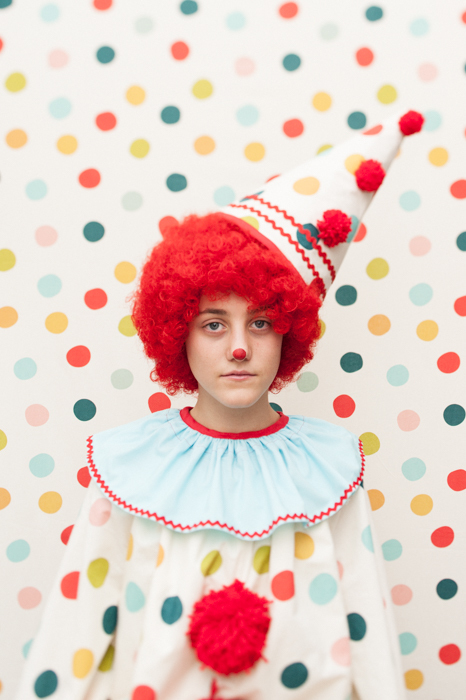 "Sneaking into Clowns Dressing Room"
I just finished Future Home of the Living God by Louise Erdrich and Little Fires Everywhere by Celeste Ng, both of which I loved. I have a piece that will be in New York as part of the Artbox Project in March at the Stricoff Gallery, otherwise my website vanessafilley.com and my instagram are good places to track what I am working on.